Welcome to this issue #185 of the AbiWord Weekly News. Nothing really to follow up on; who wants to get nekkid!? I have this theory that states I can get away with stuff if no-one tells Hub. So far, this theory has tested positive. → Barnabas Davoti wishes to create a stand-alone application to convert Rich Text Format documents into some general form of eXtendable Markup Language documents. Naturally, he appeals to the masters of this concept, the AbiWord developers. Though AbiWord is perfectly capable of performing much of the functionality at the command-line, its API is not separated for this kind of functionality. However, Barnabas remains excited about its capabilities and has some unanswered questions on the list (hint, hint). § I feel the onset of spooky music coming from the cliffs of Collinwood! 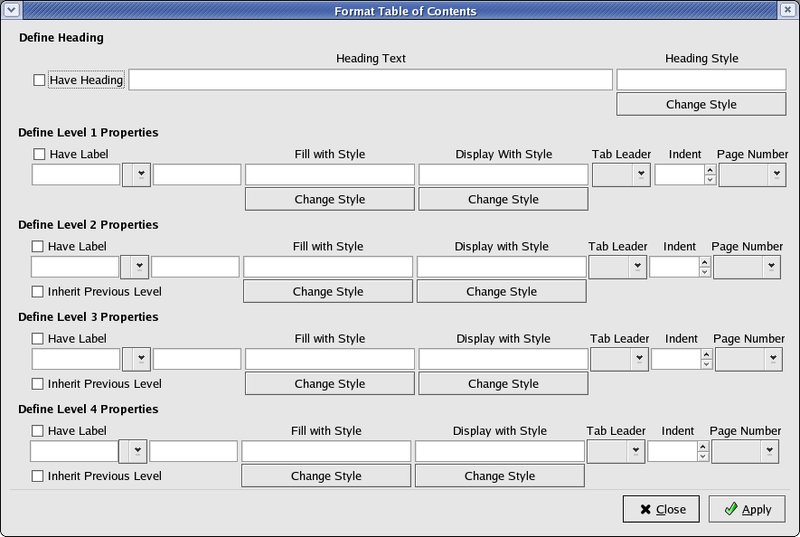 commit: Basic Ground Work for the Format Table of Contents dialog. commit: updates to Format TOC dialog. → Table of Contents remain the hot topic! 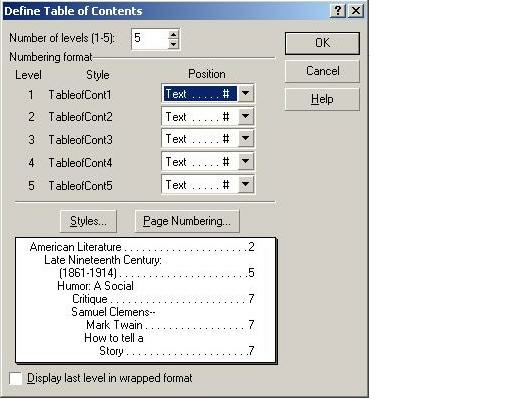 There was much discussion regarding the dialogue layout, with all the functionality our Table of Contents possesses, concepts of the layout travelled from Martin's Original to Hub's Conception, but, in the end, the best idea came from Peter Lundqvist (see ASCII art in “commit: Basic Ground Work for the Format Table of Contents dialog.” As a comparison in functionality, Will sent in a screenshot of WordPerfect's TOC dialogue. And that brings us up to the SECOND half of this discussion, where Charlie's offers up his own dialogue mockup. This began a give and take discussion about simplicity versus power, inspired by a farm girl who taught Charlie how to use MSOffice. Other screenshots have since been lost in the void that is web decay. § Billy the Luck! You can't help but love that name! → Hello, Deutschen users, are you experiencing unexplained errors? Ja? This could be related to AbiWord's handling of “u mit umlaut” in “ueberschrift” styles. 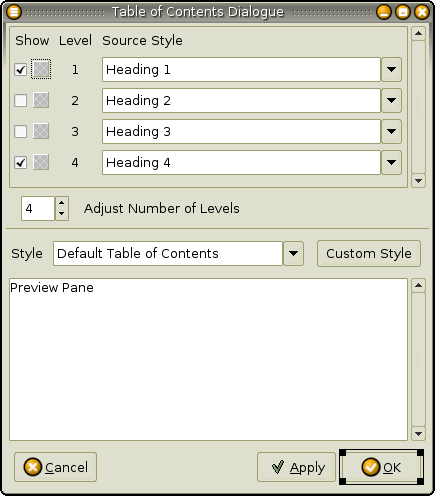 The relating error has since been fixed; upgrading to the latest AbiWord should work on re-importing the source document. → Some of you, especially Windows users, may have noticed an issue with our Star/OpenOffice writer plugin. Specifically, you may not be able to actually open Star/OpenOffice files. Please query and confirm, or file related bugs. Even better, however, would be to get a few more people willing to improve the functionality of the plugin. → Michael (Coady?) wishes to know why AbiWord's file-chooser does not include the “X delete file” function. To clarify the logic to this, it was decided by people who know better (read: HIGsters), that built-in delete functionality in the file-chooser was A Bad Idea™, and it appears that this will officially be stripped out soon. For more information, read this entry. § Isn't nice to know stuff you like will disappear someday? Hubert Figuière 4 A fix for bookmarks in .doc plusse some bug squishing. Tomas Frydrych 121 BiDi refactoring and some related graphics bits. Hubert Figuière 29 MacOS X gets some fixes, a fix for bookmarks in .doc, Project Builder work and l'bug. Frodo Looijaard 8 A big thing with the Psion plugin, for more information, click the cvs commits link at the top of the table. Johan Björk 4 QNX-fix-i-ness and implementations. Kenneth “Jeremy” Davis 1 A build fix for the TOC on Windows. Despite a general rise in the markets, ClosAssi has begun to drop. Alan BlueSpan noted that this drop would probably continue until the next release; however, Louis Bugkeyser, on the other hand, feels that there's little room for ClosAssi to drop further, and furthermore, believes that the market rise will continue until the next release. It should be quite clear by now that, 1950, Wish for Automatic Table of Contents, is technically satisfied. Users waiting for a stable release, however, still have four or more months to wait. As a result, we introduce 2136, A Latex importer would be nice and useful. What could you expect beyond squat? It's cute that you looked here. Nothing new since 2.0, but the ToDo list looked promising. I missed all sorts of things last week (not sure why). Since there's nothing new this week, I'll mention the other half of last week's discussions. There was repetitive discussions regarding a command-line interface for Conglomerate, last week. Starting back in the new-site era, with the reply “ Conglomerate Command Line (Was: RecipeML)” and continuing through to “ Supported Document Types.” Both times, the discussion regarding the command-line functionality was started by the local Master of XSL Voodoo, Jeff Martin. Dave pointed out that he was interested in shifting towards Gnome Office's plugin management code (we have specialised code for that? ), which may mean that this is just the development release away! Your mama, that's what up! Raise your hand if you think we should donate our $2000-odd dollars to SavingAngel!